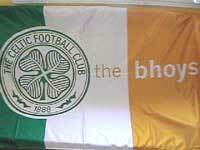 This flag with "the bhoys" is accurate and can be bought from club shops. Yet another flag is used by Celtic supporters: a white saltire on a green background. This image (located by Thierry Gilabert) is a photo of a flag bearing an IRA slogan, which now appears to be rarely seen. Celtic Football Club has no association with the IRA. 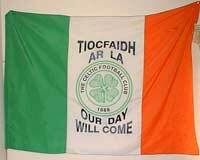 This flag bears the slogan of the IRA - our day will come. Although this organisation is unfortunately linked with Celtic, this is not the flag of Celtic Football Club. In fact that picture must have been taken a long time ago because the club crest is now copyrighted and such flags cannot be found around Celtic Park anymore. The New York Times today has a piece on the Rangers-Celtic rivalry in Glasgow and its connection to Protestant-Catholic history. I found it interesting that Celtic fans wave the flag of the Irish republic at matches. many Celtic supporters, apparently, are descendants of 19th-century Irish immigrants. Many years ago (I think it was in 1961) at a football match where Celtic were playing, I was surprised to see some fans waving an alternative version of the Irish Tricolour. This left off the orange band and substituted a yellow one. I speculate that this was done by fans who were unwilling to tolerate the appearance of any Protestant symbol on their flag - even if it was that of the Irish Republic itself. They would have known that yellow and white were the colours of the Papacy and so substituted yellow. I have not seen any such flag in recent years. I wonder how common it was 50 years ago?